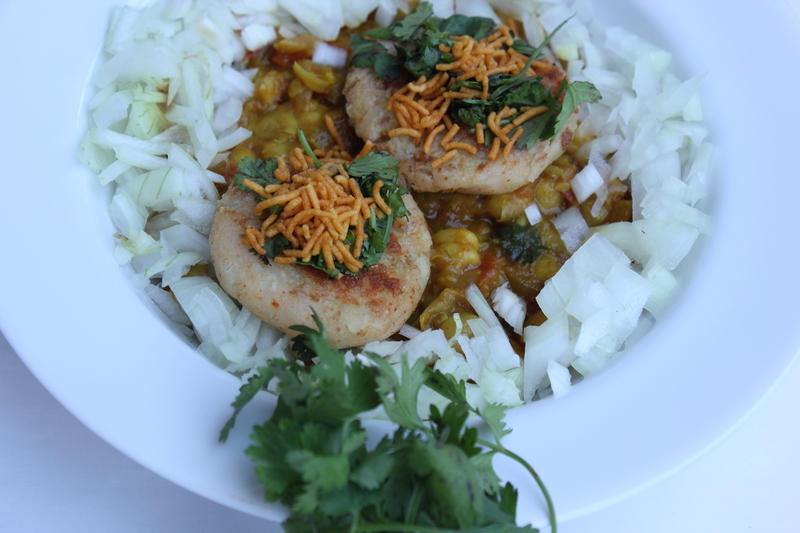 Here I come with one of my favorite recipes – Ragda Patties. 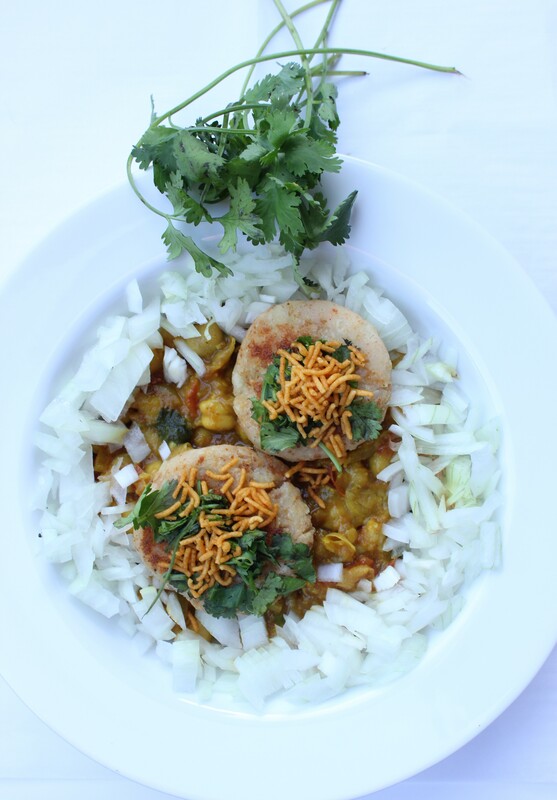 It is basically shallow fried potato patties served with spicy chickpeas curry. Trust me, its heavenly good. Its a popular Indian street food and has its origin in Mumbai. I am a sucker for potatoes. I can have any form of potato in all 3 meals of the day. I love potatoes so much that sometimes I dream about them 😀 .. silly maybe, but I am what I am. And this combination of potatoes with chickpeas is just simply deadly. I made this recipe for Sunday dinner. It may look like a long list of ingredients and too overwhelming, but its all worth it in the end, believe me. I have learnt to make the perfect chickpeas curry with lot of trial and errors over years. The curry has just perfect balance of spices and neither is too hot nor too mild. Please reduce the amount of chillies if you want less heat. You can get all the mentioned spices from nearby Indian store if you don’t already have them. Soak the chickpeas for 6-8 hours. Boil them in a pressure cook by adding 2 cups of water and 1 teaspoon of salt for 5 whistles on medium heat. While the chickpeas cook, heat up a wok on medium high heat and add oil. When the oil is steaming, add cumin seeds. Saute for a few seconds and add chopped onions with a pinch of salt. Salt helps browning onions quickly. Saute until onions turn translucent. Should take less than 10 minutes or so. Next add coriander powder and saute for a minute. Then add turmeric and red chili powder and again saute for a minute. Next up add garam masala and chana masala, mix for a minute. Please note that this sequence of adding spices is very important and changing it will result in differently tasting chickpeas. Add pureed tomatoes and cover the wok until you see oil droplets oozing our of the mixture from the sides. Separate boiled chickpeas from water, but keep the water reserved. Add the chickpeas to the onion- tomato mixture and mash a little bit with the back of your spatula. This helps in infusing spices in chickpeas. Now add the reserved cooking water and bring to a boil. Switch off the flame and add coriander leaves. Check seasoning and adjust for salt. Mix all the ingredients for potato patties with your hands (clean hands!). You should be able to get a dough like consistency. Make small balls and flatten them between the palms of your hand. Heat a skillet on medium heat and spread a teaspoon of oil on it. When the skillet is hot enough, shallow fry the patties using as little oil as possible. I used 1/2 teaspoon of oil for each patty on average. Switch off the flame when both the sides are nicely browned. In the serving bowl/plate, add chickpeas and potato patties. Sprinkle chopped onions. Garnish with coriander leaves. Finally, if you like my recipes, please hit like and follow :). Please leave your comments and suggestions in the comment section below and I’ll get back to you as soon as I can, I promise.